In the spirit of Dickens's Ghost of Christmas Future, I thought again of the "demon" that I have outlined as a simple but over-arching vision of ideal pricing. It is easy to get lost in the many currents of discussion about the strategy and tactics of pricing -- and to lose sight of the deep connection of pricing to how enterprises think about their business, their customer relationships, and the marketing, production, and design of their products and services. There are many strategies for more effective pricing, such as based on value, performance, solutions, and outcomes. These relate to broader business directions, such as one-to-one, customer-first, and customer-value-first, as well as the growing focus on customer experience. While these generally point in the right direction, we often fail to see the forest for the trees. We need a fundamental principle to guide us, and to make it clear how to align all aspects of a business. My demon illuminates that driving principle. Think of the Value-Pricing Demon outlined below -- What would the demon do? If your pricing stays true to that, success will follow. Imagine a demon that might power a system of commerce. Imagine that this demon has perfect ability to observe activity and read the minds of buyers and sellers to determine individualized "value-in-use" -- the actual value perceived and realized by each buyer, at each stage of using a product or service. The demon knows how each buyer uses the product or service, how much they like it, what value it provides them, and how that relates to their larger objectives and willingness/ability to pay. It understands the ever-changing attributes of current context, where the value of a given item or unit of service can depend on when and how it is experienced. Furthermore, this demon can determine the economic value surplus of the offering -- how much value it generates beyond the cost to produce and deliver it. The demon can go even farther, to act as an arbiter of how the economic surplus can be shared fairly between the producer and the customer. How much of the surplus should go to the customer, as a value gain over the price paid, and how much should go the producer, as a profit over the cost of production and delivery, to sustain their ability to continue those activities. Such a commerce demon might thus serve as the brains of a system that sets prices that are adaptive and personalized -- to set a price for each person, at each time, that is fair to both the producer and the customer. Imagine we could build an e-commerce system, with advanced programming and data that worked as an artificial intelligence version of this demon. Prices would not be pre-set by the seller, but would be set dynamically by the demon for each item or unit of service, at levels that would be fair and acceptable to both the buyer and seller. Actually, a rather different pricing demon has long been widely accepted as central to our economics. 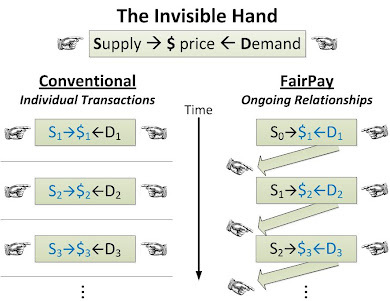 Isn’t Adam Smith’s invisible hand just the hand of a demon that guides the setting of prices based on a balance of supply and demand? So if we have Adam Smith’s demon, why do we need my demon? Because the invisible hand works nicely for markets of scarcity, but in the digital era, we face markets of abundance. The task of these new markets is not how to allocate scarce goods, but how to sustain the creation of services that can be replicated without cost or limit. What we now need to allocate is a fair share of the customer’s wallet. This book shows how thinking about my demon can help us do that. 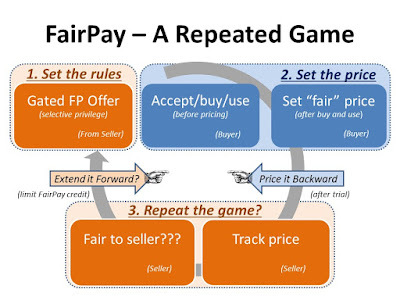 FairPay is a business architecture centered on a new value feedback process that adaptively seeks to approximate what the demon knows. 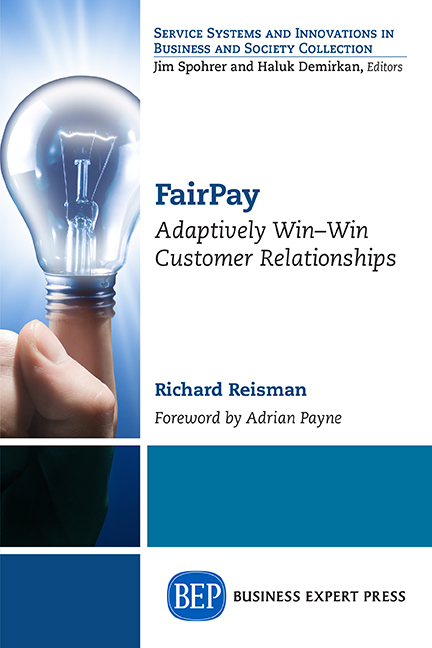 This Prolog to my book, FairPay: Adaptively Win–Win Customer Relationships is also online. I first posted about this (with added commentary) in 2015: Harnessing the Demons of The Digital Economy. 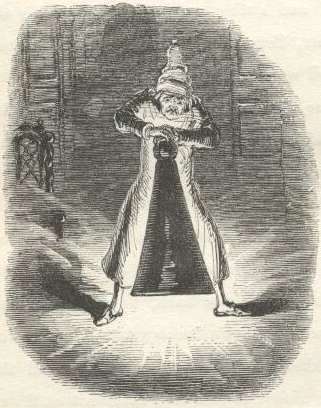 (A note on ghosts and demons: Of course my demon is a converse of Dickens' ghost, which pointed to the dark scenario -- my demon points to the ideal scenario -- but both serve as thought experiments. 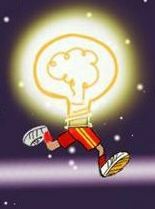 I call it a demon in the same spirit as the well-known benign demons of physics: Maxwell's demon and Laplace's demon -- those have long served as very useful thought experiments.